Hearts & Plaid. These special Clancys Cure Christmas Stocking Pawkerchiefs will help support Cornell University College of Veterinary Medicine for canine cancer research. 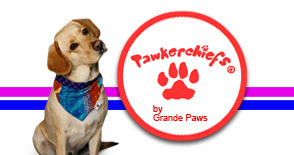 For each Pawkerchiefs sale, $10 will go directly to Cornell University. All content ©2013 Grande Paws. All rights reserved.